Solitary | Where's my backpack? 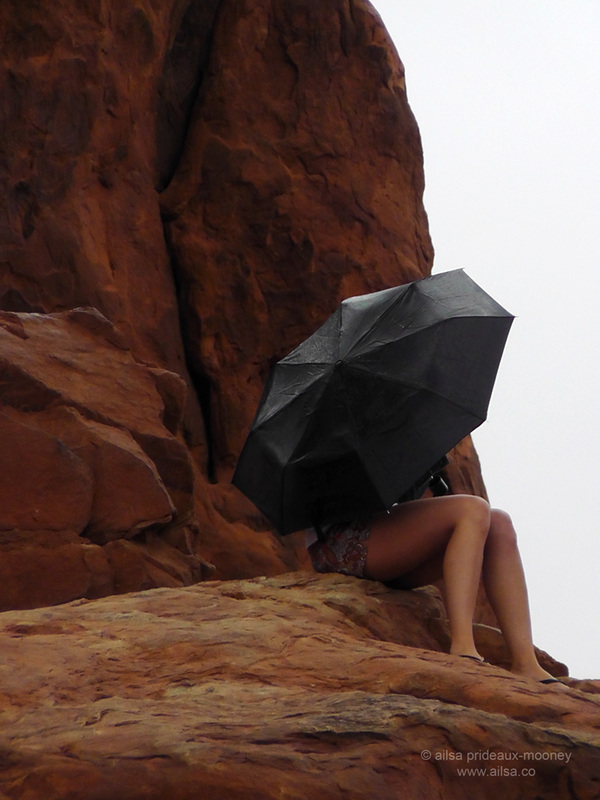 During my recent road trip, I travelled through Utah and visited Arches National Park. 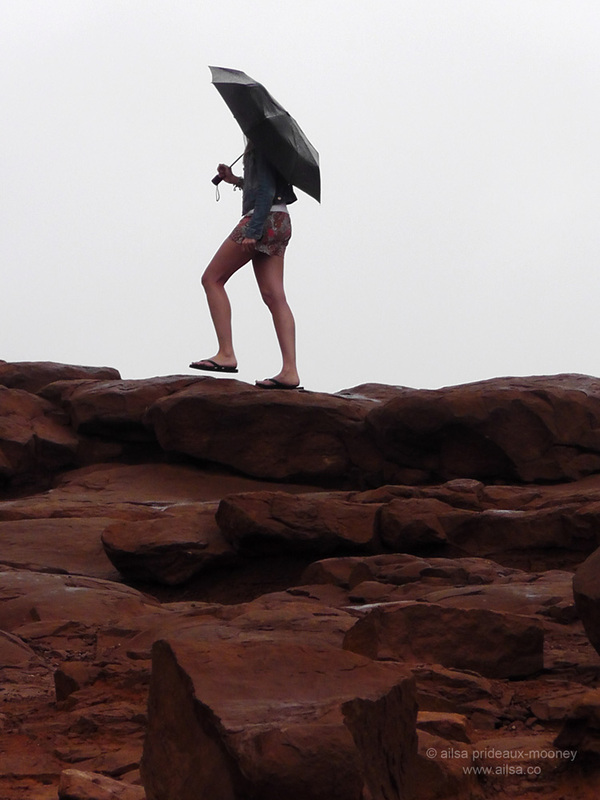 It was the height of monsoon season, so instead of glowing red rocks against bright blue skies, I was greeted with dark red on an eerie foggy backdrop. As I was revelling in the grandeur of Arches, a solitary girl caught my eye. 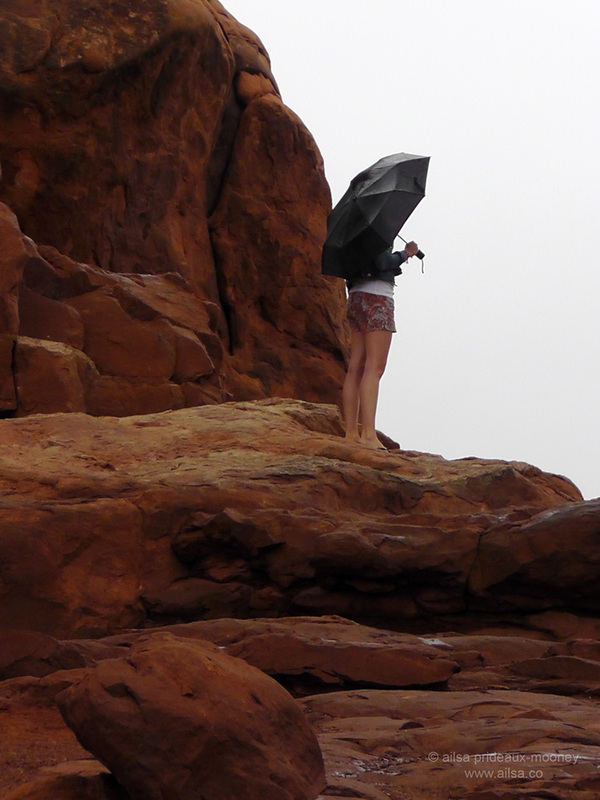 She was hiding from the rain under an umbrella, gazing out into the mist and rain that surrounded us. She created such a striking figure against hazy skies and flushed rock, I simply couldn’t resist the photo opportunity. This entry was posted in Photography, Travel, United States, Utah and tagged photography, photos, pictures, postaday, travel, writing. Bookmark the permalink. Excellent photos for the challenge, Ailsa! Very cool. Was she aware you were taking pictures of her? What a perfect set of photos for the challenge! Haha, I thought the same thing, Madhu, flip flops would not be my first choice, especially in the rain which made the rocks slippery! Very nice shots Ailsa. ! I admire the young girls confidence in the ‘grip’ of her flip flops ! wow this could be my eldest daughter!! (It’s the legs!) Great photos! Haha, good question, ad, and yes, her face was just as beautiful as her legs. I got a few photos of her turned towards the camera, but didn’t publish them because I didn’t have a chance to ask her permission, she disappeared into the mist before I could talk to her. Great pictures. I feel like they should be in a magazine or something. Great catch! The last one is my favourite, too. LOVE IT.. I would love to think these were posed but I have some from Korea where they totally looked posed but were absolutely not.. great challenge.. can’t wait to see the direction other’s take on this theme.. love the color of the rocks.. and glad i’m not the only one who wears flip flops on crazy terrain.. I think I just realized this was not a challenge.. but it’s a great theme.. so I might use it..
Grin. It wasn’t that high up, the walk to this point was pretty tame, although it got more interesting further along! Very apt for the challenge. Well done. Thanks Hitesh, glad you enjoyed it. Thanks for stopping by and commenting! what great shots! like it was planned. Nice job! Nice pictures! Especially because ypu said she wasnt aware of you taking pictures of her! Love the last two images. Really illustrates the mood. 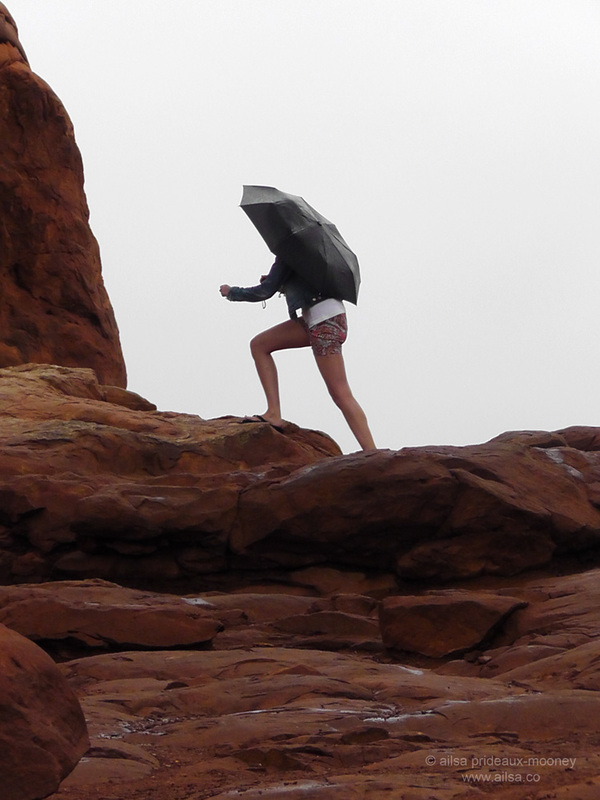 The Arches is my favourite USA National Park (of the few I’ve visited), and I love the girl with the umbrella agaisnt the red rock. Great shots. Thanks, Silken, Arches was my favourite of the Utah Parks… until I made it to Zion. Zion is my second favourite. There’s not much in it though! Love these photos! They tell such a story! I am traveling and blogging now in Utah, Capitol Reef, Bryce, Zion. Great time of year to go! It’s such an amazing part of the world, Cindy, have fun on your travels! Hey, yes, that would be cool if you post a link back to the site. Cheers! It’s posted now. Thanks so much, we really appreciate it! Awesome, I have to say, your blog made me crack up, ace idea! Honoured to be a part of the toe show! All your photographs are beautiful, wonderful blog. God bless you. Thanks for letting me camp out in your blog for a little while today. I had a great time and tried to leave my campsite as good as when I arrived. I’ll be back!